This Honda hot water pressure washer is both durable and powerful. The Honda GX 390 Engine and an AR Triplex ceramic plumger pump sit on a portable four wheeled push bar frame for support and ease of use. With 4.0GPM and 4200PSI and a 118 degree temperature rise, this pressure washing unit will get the job done. Each model comes with all the necessary accessories for you to get started right away. To protect your investment there is a 3 Year Warranty on the engine and 5 Year Warranties on the Pump and Frame! 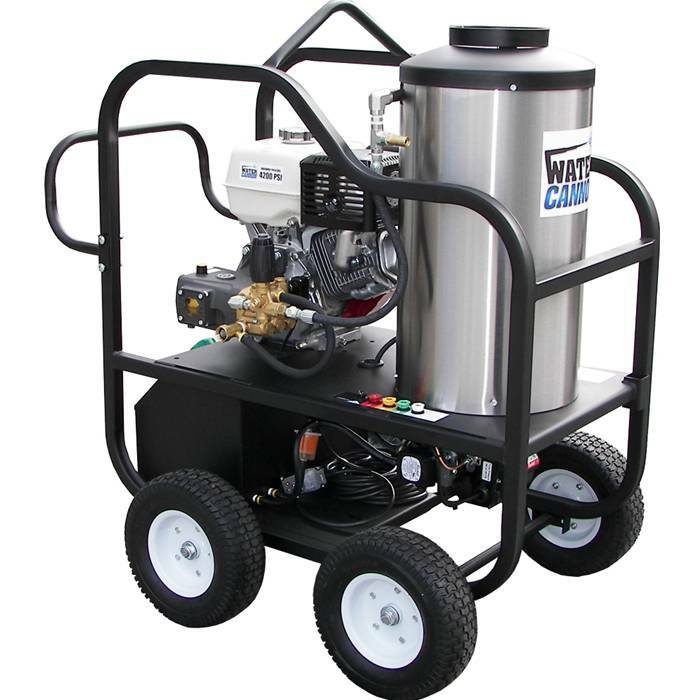 This Water Cannon Pressure Washer includes an Upgraded External Recirculation Plumbing Feature that cools the water while the Trigger Gun is closed. The extended service life Triplex Ceramic Plunger Pump holds up to commercial and professional daily use. Additionally this model includes an overheat safety valve that will open and close automatically to allow the recalculating higher temperature water to be released and allow cool water to replace it, helping to protect the wearparts. There is an optional Adjustable Pressure & EZ Start Feature available SKU 11234 available by calling 1-800-333-9274 and speakingwith one of our industry trained sales team. All of our models pass a 15 point inspection and are tested in the USA and delivered professionally boxed and ready to operate -- we even Armor All the tires! This Water Cannon Pressure Washer includes an Upgraded External Recirculation Plumbing Feature that cools the water while the Trigger Gun is closed. The extended service life Triplex Ceramic Plunger Pump holds up to commercial and professional daily use. Additionally this model includes an overheat safety valve that will open and close automatically to allow the re-circulating higher temperature water to be released and allow cool water to replace it, helping to protect the pump wear parts. There is an optional Adjustable Pressure & EZ Start Feature available SKU 11234 available by calling 1-800-333-9274 and speaking with one of our industry trained sales team.